I have to be honest, it was hard to be hyped for Boukoku no Akito. Yet somehow, seeing that the first OVA was finally available for viewing sparked a little something in me that only Code Geass is capable of. Note: Just in case someone hasn’t watched the original and has managed to avoid spoilers thus far (what a ridiculous idea! ), heavy spoilers after the jump. Continue Reading "CODE GEASS: Boukoku no Akito – 01"
How you end up reacting to this comedic, light-hearted, frequently downright silly, spinoff OVA based on the Code Geass series depends pretty much entirely on what you’re looking for in it. Continue Reading "CODE GEASS: Nunnally in Wonderland"
The spin-off to CODE GEASS, “Akito the Exiled” (literally, “Akito of the Ruined Country”), is finally gaining some steam on the production side of things with a 90-second promo video — three and a half years after the second season finished airing. Along with it came the starring cast announcment: Irino Miyu as Hyuuga Akito and Sakamoto Maaya as Reira Markale (official English spelling pending). 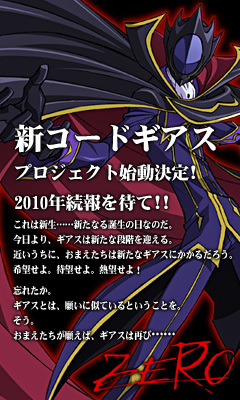 The side story takes place in 2017, around the time Lelouch took on the alter-ego “Zero” and built up his “Black Knights” rebellion army (i.e. season one). The setting is Europe, where the Euro Universe (E.U.) allied nations are being invaded by the overwhelming force of the Britannia Empire. On the verge of defeat, the E.U. army forms a special division known as “W-0″, which a young pilot named Hyuuga Akito is a member of. Coming to the E.U.’s aid is a former Britannia aristocrat named Reira Markale, who commands the “Wyvern” Knightmare corps comprised of Japanese teenagers. They recklessly plunge into a battlefied where the survival rate is extremely low to fight for their freedom and have a country they can return to that feels like “home”. Thus begins their fight against the adult world. The premise has been more or less laid out (translated above), but it’s still relatively unclear on whether Boukoku no Akito will be a full TV series, an OVA, or a film. What we do know is that it will be screened in theaters this summer and that it will be directed by Akane Kazuki (Tenkuu no Escaflowne, Noein: Mou Hitori no Kimi e) and once again feature original character designs by CLAMP. Judging from the screening date, we’ll likely see this long-awaited spin-off in either summer or fall of this year. 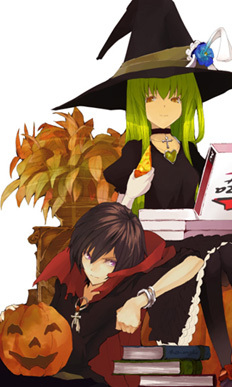 Update: A movie project for the original “Hangyaku no Lelouch” story has also been announced. Continue Reading "CODE GEASS: Boukoku no Akito – PV"
New Code Geass Coming Soon? So it looks like we can revive the discussion about whether Lelouch is dead or alive. According to a graphic on the mobile phone site for Code Geass, a new Geass project has been green-lit. Somehow, I’m not too shocked that this is happening, and really it was only a matter of time before Sunrise came back to this successful franchise. Two of the possibilities that came to mind are that it could be a direct sequel to R2, or it could be a completely different take, like Mai-Otome was to Mai-HiME. Astute observers will note that this announcement coincides with Lelouch’s birthday. There’s no word yet either whether it’ll be an OVA or full series or what, but apparently there’ll be more news in the new year. Continue Reading "New Code Geass Coming Soon?" As some of you might know, Gotou Yuuko voiced Anya in CODE GEASS R2 as well as many other popular characters like Mikuru from Suzumiya Haruhi. She appeared on yesterday’s episode of CosCosPlayPlay – a program on Fuji Satellite TV featuring a lot of cosplay tips and info – cosplaying as Anya. In the video, she does a sketch (she’s known for being good at drawing) and acts out some lines (explaining to the host who Marianne is in the process), all while in costume. It’s pretty cute and worth a watch if you’re a GEASS fan, though I don’t think the Anya look really suits her. Continue Reading "Gotou Yuuko as Anya on CosCosPlayPlay"
Facing Lelouch with her eyes open, Nunnally notes that it’s been eight years since she’s seen his face, and she calls it the face of a murderer. Continue Reading "CODE GEASS R2 – 25 (END)"
Despite the FLEIJA warheads taking out more and more of his forces, Lelouch orders his men to keep attacking the Damocles and make it continue firing. Continue Reading "CODE GEASS R2 – 24"
In any case, I hope this is new to some of you, but if it’s not, you’re still more than welcome to share your thoughts about it. Expect some other PVs and performances to be posted soon, but in the meantime, enjoy the video. Continue Reading "FLOW – WORLD END Live (Music Station)"
As word of what happened at Pendragon spreads among the Britannian ranks, Jeremiah tries to put a halt to what he thinks is a rumor, but Sayoko suddenly appears to confirm that it is probably true. Continue Reading "CODE GEASS R2 – 23"
As the new emperor, Lelouch enacts sweeping changes to the way Britannian society works by abolishing the nobility system, breaking up the conglomerates, and liberating the Numbers. Continue Reading "CODE GEASS R2 – 22"
Some of you may recall how I was saying that FLOW should’ve been brought back to perform an opening song for CODE GEASS several months back. In addition, you may recall how I felt that their “WORD OF THE VOICE” song used in PERSONA -trinity soul- may have suited CODE GEASS just as well, as some MAD videos have shown us. Well lo and behold, as I’m sure everyone’s aware of by now, FLOW was brought back for the second opening with this song, “WORLD END”, and ALI PROJECT was similarly brought back for the ending theme, “Waga Routashi Aku no Hana” 「わが﨟たし悪の華」. Given how the series is going now (i.e. with the last 40+ episodes feeling kind of hogwash in light of the recent turn of events), I’m starting to find WORLD END’s lyrics a lot more befitting. The PV also does a good job portraying this too, with a barren desert being the most prominent image throughout. Personally, I wasn’t a huge fan of this song much when I first heard it back in episode thirteen, but as with most anime songs, it grew on me over time thanks to the inevitable association of it to the series. Continue Reading "FLOW – WORLD END PV (CODE GEASS R2 OP2)"
Still standing inside the crater left by the FREIJA, Suzaku is joined by Nina who is finally realizing what a horrible thing she caused. Continue Reading "CODE GEASS R2 – 20"